On August 8 2018, The Edwards Interfaith Chapel and Community Center (EICC) will present a magical evening honoring Susan and Tom Washing. 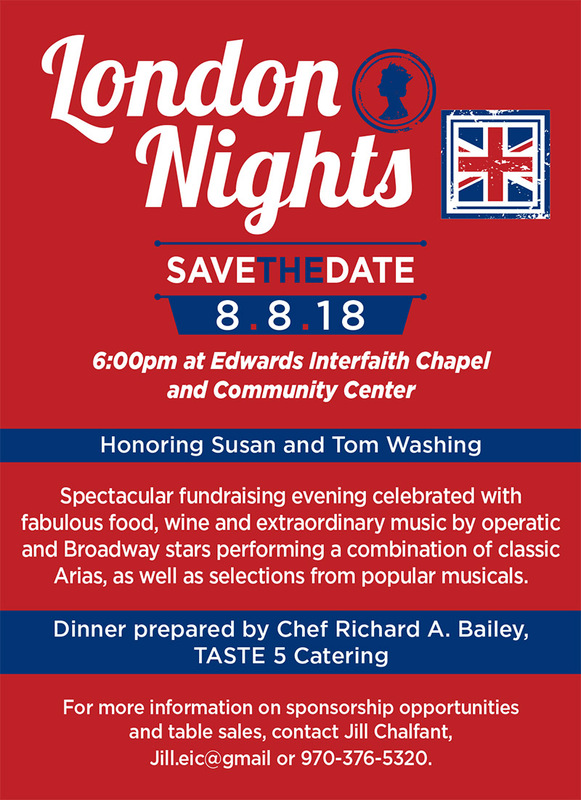 Spectacular fundraising evening celebrated with fabulous food, wine and extraordinary music by operatic and Broadway stars performing a combination of classic Arias, as well as selections from popular musicals. For more information on sponsorship opportunities and table sales, contact Jill Chalfant, Jill.eic@gmail or 970-376-5320. For anyone in need of a warm supper, The Edwards Interfaith Chapel and Community Center offers dinner every Thursday at 6pm on the main floor of the Center. No advanced reservations or planning is necessary, just show up at the center. The supper is supported through the help of the congregations and volunteers as well as generous donations.